The drive down to Cali is pretty uneventful, apart from the numerous tolls. I’m a little envious of motorcycles as they have a special skinny toll free lane at the toll booths. I’m staying at a hotel for the week, best spot I could find with parking for my Land Cruiser. Lucky I confirmed ahead of time as they have exactly one full sized parking spot inside the gates. Cali is quite a bit lower in elevation and much warmer. It feels like being in southern California. Plenty of palm trees. I visited the Cali gold museum, which is a subsidiary of the Bogota gold museum. Not much going on in the downtown area, the Iglesia la Merced dates back to the 16th century. The neighborhood of El Penon is good for walking, plenty of restaurants and little squares to hang out in. I spent one day at the Cali zoo. It’s small but nicely laid out. One of the most popular exhibits was the Australia zone. I was amused as it contains just about every Australian cliche you can imagine. Except maybe a Crocodile Dundee actor. I always enjoy seeing the tapirs. From Cali I head south to Popoyan, The White City. Should be obvious how it got its nickname. Great to walk around, the streets and sidewalks even in the very center of town are wide and spacious. It’s a little harder to find restaurants and stores as they are not clustered around the Plaza de Armas (town square) as is usual. The landmark of Popayan is the Puente del Humilladero. I’m staying at a nice hotel (above) just a couple blocks off the town square. There is no place in town that offers both accommodations and parking for a 2.3m vehicle so I am parked in a lot down the street. It wasn’t until I was leaving on Saturday to head south that I found out that the lot is closed on weekends (this is not uncommon but usually they tell you that when you park). No problem, another couple of days enjoying the town. As with many other Colombian tourist towns, there are plenty of tourists on the weekends but they seem to be mostly Colombians. Side note: In towns there are two ways to stay at a hotel or hostel with a large vehicle. With my rooftop tent I am 2.3m tall, a standard garage entrance is 2.1m . Method 1: Find a place ahead of time that can accommodate a 2.3m vehicle, easier said than done in many city centers. (I guess option 3 is stay way outside of the city but that’s no fun). iOverlander is very helpful here. Also on Airbnb I have a standard template that I email to potential hosts stressing just how large and tall my vehicle is. I have had some that still insist that I can fit into a 2.1m garage. Method 2: Figure out where the central location for lodging, hotels, hostels is. Then find a parking garage nearby, park myself then head out and find a place to stay. This is the best option in places with narrow twisty streets. Usually parking is only a few dollars per night, it’s secured with an attendant during the day and locked up overnight. Once parked I grab my daypack and a duffel bag and look for a place to stay. The only downside is finding that the lot is closed when you’re ready to leave, as above. I’m not the only person this has happened to, it seems like it’s a common thing. With my Land Cruiser finally freed from the parking lot, I continue south to the border town of Ipiales. It’s a long drive, 333km which takes about 8 hours plus numerous expensive tolls. Ipiales’ claim to fame is the Santuario de las Lajas. In 1754 someone saw an image of the Virgin Mary in a grotto on this site on the side of a canyon, and numerous shrines have been built here ever since. The latest and most ambitious was started in 1916 and completed in 1949. It’s pretty impressive. The path to the sanctuary goes steeply downhill from the parking lot. Not bad on the way down but at 2950m (9678′) I am huffing and puffing on the way back up. Luckily there are many souvenir and snack shops along the way. Leaving Medellin I head south to the famous coffee region of Colombia. It’s only about 280km to the town of Filandia but with recent rains the road though the Andes is blocked by landslides in many places. In some areas it’s just a short detour around the blocked section of road but at one spot I had to wait for an hour for bulldozers to clear a path through a fresh landslide. Probably about 10 hours to make it through 280km, and in spite of the road conditions they were still charging the full toll amount. Filandia is a small rural town in the heart of Colombia’s coffee region. Nearby Salento seems to get all of the tourists while Filandia seems much more authentic. One thing I didn’t expect was that despite the amazing coffee that comes from Colombia, it’s hard to find a good cup of coffee. All of the primo coffee is exported to bring in as much money as possible. What’s left is called tinto, basically what the rest of the world doesn’t want. My destination is the Steel Horse Filandia, which will some day be a full service hostel for the Filandia area. As of today it’s not quite open, but they are accepting self sufficient overlanders for camping. It’s a mile or so down a twisty muddy road from town in a very quiet location. It’s owned by Yvette and Paul from the UK; Paul is currently back in the UK so Yvette is handling all of the work associated with getting the hostel ready to open. Below right you can see a picture of their cat, also named Paul. This cat is part parrot; he likes to jump up and perch on people’s shoulders. One day I make the drive to the Valle de Cocora to see the famous wax palms. The 200 foot tall palms only grow in this valley. Then an afternoon in Salento. Yes, this is definitely where all of the tourists go. Nice for an afternoon but a little crowded. One day I am hitching a ride into town with Yvette and her friend in Yvette’s old Nissan 4×4 when maybe a half km out of the Steel Horse we are flagged down by a little girl jumping up and down in the middle of the road. She says her brother has cut himself with a machete and they need help. Pulling into their driveway, the mom comes out and explains that they have no car or phone so all they could think of was to post the little sister on the road to flag down the next vehicle. He accidentally sank the machete into his calf around 10:00 and it’s now around 12:00. Not much traffic on this road. He comes limping out of their small house with a dish towel tied around his calf and still dripping quite a bit of blood. We get him and his mom set up in the back and head into town, and in the little Filandia hospital they take him right into their ER. Later in the afternoon the whole family, including the limping kid with the newly stitched leg, comes up to the hostel to say thanks. They have a bunch of fresh pineapple and the mom has brought some dish towels so she can scrub the blood out of the back of the Nissan. Yvette accepts the pineapple and tells them not to worry about the blood. Later in the week Yvette loses her cell phone somewhere between the hostel and town. She spends the entire day searching everywhere in the hostel and along the road, then the next day goes to town to buy a new phone. The day after that a guy shows up at the gate with her phone in hand. He’s found it lying along the side of the road and it’s a complete mystery how he knows that it’s hers or where to return it. It seems like I am setting a new record for getting pulled over here in Northern Colombia. Since leaving Cartagena I’m averaging 2 or 3 times per day getting stopped at police and army checkpoints. Most of them are pretty quick and friendly, just asking me where am I coming from, where am I going, check my papers then on my way again. In one small town two police officers on a motorcycle pull alongside and hit the siren. I think they’re just bored; after the usual questions we chat for awhile about how long I’ve been in Colombia, how do I like their country, how long have I been traveling. I go to the giant rock of El Penol outside Guatape to climb the 675 steps to the top. It’s a sunny day and it gets pretty sweaty by the time I reach the top. Luckily there are several little cafes on top selling cold drinks and ice cream. Quite a view out over the reservoir. It’s a very popular tourist area for people from Medellin, just a few weeks later there is a major disaster when a party boat loaded with people sinks right out there, killing many people. I drove through Guatape for a bit, hoping to stay for the night. It’s famous for its brightly colored buildings and packed full of tourists. There was no overnight parking anywhere that I could fit into, so had to drive back past El Penol to a little hotel on the reservoir. Next day on to Medellin, second largest city in Colombia. Located in a large valley of the Andes mountains the weather is pretty much perfect all year long, giving it the nickname of “City of the Eternal Spring.” Since it’s very long and narrow one subway line covers pretty much the whole city. The highlight of central Medellin is the Plaza Botero, filled with lots of sculptures by Fernando Botero. The Museum of Antioquia is located on the plaza and is also chock full of Botero paintings and sculptures. The museum has a cafe on the square that is the perfect place to have a snack and watch the city pass by. I’m staying at a hostel in the upscale Poblado neighborhood. They offered to let me camp in their driveway but it’s really tight so I opt to just park there and stay in a dorm bed. The Metrocable is a cable car line that ties into the main subway line, giving the poorer people up in the hills easier access to the rest of the city, as well as panoramic city views for tourists. Unfortunately when I got there it had just shut down for the entire month for maintenance. Whoever opened this burrito shop has been to Chipotle once or twice. It’s almost an exact copy of the Chipotle menu and assembly process, in about the space of a one car garage. The burritos were excellent, I had to come back for more. When I got insurance in Cartagena I only bought one month, as I didn’t have clear plans for Colombia and didn’t yet know how amazing this country is. The month is at an end so I need to get another month or so before driving out of Medellin. I didn’t think it would be a problem as the agency near the port in Cartagena had no problem writing a policy for any amount of time, but everybody in Colombia buys a year at a time. It proves very difficult to buy less than one year of insurance here, but after a full day of chasing around to different offices I finally find a place that will give me a two month policy. I am really enjoying life in Medellin; the weather is perfect every day, people are very friendly, the Poblado area is packed with restaurants, bars, shopping. There are a couple of popular beach spots on the Caribbean coast, but I decide that I have had enough of hot weather for awhile and it’s time to head to the mountains. The highways are pretty good, although the main highway south to Bogota is under construction everywhere. It’s being expanded from a 2 lane highway to a 4 lane divided highway, so at some points I’m on the new section with a passing lane, other times all traffic is on the old two lane section, or all traffic on the new section. It constantly changes and if there’s not a lot of traffic I have to really pay attention to figure out where I should be driving. Also paid the first of many tolls to come. Stayed one night in a truck stop hotel near Bosconia, where the highway from Cartagena meets highway 45 south to Bogota, then another night in Aguachica. This guy has a chihuahua riding on his shoulder like a parrot, propped up by his passenger. It looked pretty happy. Stopped for lunch outside Bucaramanga, great meal of steak with more steak. A big change from the usual meals in Central America. Arrived in San Gil. Not quite the mountains yet but much better weather. San Gil is famous for white water rafting trips, climbing, and caving. Then on to Barichara. It’s an old colonial town up in the hills, founded in 1705. Very picturesque and a great walking town. It’s a favorite location for filming telenovelas and movies, and has a lot of upscale homes hidden behind those white walls. Somewhat touristy but not over the top. Then on to Villa de Leyva. Founded in 1572, it’s much larger and more touristy than Barichara, but still quite nice to walk around. The main square is huge, the largest in Colombia. It gets pretty crowded on the weekends but during the week it’s quiet and peaceful. I wanted to drive my Land Cruiser into the center and get a picture, but they have barriers and police there to keep it limited to pedestrians only. Will and Cate are staying at the same little hostel/campground on the edge of town. One day we sign up for the Jeep tour of Villa de Leyva. It turns out that the tour does not actually include the entrance to any of the sites, just driving us from place to place then saying “OK go buy your ticket and go inside.” We visit the Fossil of Villa de Leyva, a monastery built using fossils, a winery, and the mirador which is just a small hill above the town. With all of the wine going back and forth it ended up being a fun afternoon. As with the main square, quiet during the week but filled with tourists on the weekends. Tons of great restaurants. Colombian tapas, grilled chorizo with spicy salsa. Chihuahuas south of the US have been very friendly and happy. On to Zipaquira, about and hour outside Bogota. The major attraction here is the Salt Cathedral. They have been mining salt here for hundreds of years, and at some point the miners started carving a cathedral into the salt. The original cathedral was closed several years ago due to safety, so they have created a while new cathedral along with the stations of the cross in a new section of the mine 180m underground. With the exception of the railings and lights, everything is carved from salt. The guides encourage you to lick any part of the walls (but not the statues) to test the saltiness. Each section was done by its own group of salt miners. Some of the intricate statues took over a year to complete. The cathedral is a popular place for weddings. There is a road tunnel going down into the salt mine to allow the wedding party to drive right up to the cathedral in a limo. Finally, into Bogota the capital city of Colombia. It’s very modern and easy to get around. The Museo Nacional was originally a prison in the 1800’s, now an art and history museum. The Juan Valdez cafe in the courtyard garden is a good place to sit back and enjoy some Colombian coffee. I have a week at an Airbnb in the Chapinero Alto neighborhood. It’s a downstairs apartment in the back of a house with its own entrance. The neighborhood is quiet and safe and my hosts are super nice and helpful. Like any big city, Bogota has a range of neighborhoods and safety, with some areas fine during the day but best avoided after dark, others that you shouldn’t enter at all. Once I figure out how to buy a transit card it’s really easy to get around on the big express buses. The Gold Museum is one of the biggest tourist stops in Bogota. It has the largest collection of gold artifacts in the world. I meet up with Will and Cate for a street art tour in downtown Bogota. Very interesting with lots of details on the various artists, the types of art and crews involved, the etiquette and protocols that have developed over time. Bogota sits at 2640m, so the weather is much more pleasant the the heat of Cartagena. I actually have to put on a jacket for the first time in quite awhile. Also a bit of rain here and there so I also have to dig out my umbrella. All in all a good place to spend a week. I’m staying in the old walled city of Cartagena, it’s very picturesque. The old city is not all that big so it’s easy to walk around the whole thing. I didn’t know much about Cartagena before arriving but after a few days I can see why it’s a big tourist destination. I have a few days to wait for the container ship to arrive and spend them just walking around the city. Great street food, one day I ate nothing but food from carts. It is incredibly hot and humid though, best to take an air conditioned siesta at the height of the afternoon. Monday morning arrives along with the first snag; the ship is late. It was due in Sunday night but does not arrive until Monday late morning. We can’t get our official Bill of Lading (first step in the import process) from the shipping office at the port. They say to come back Tuesday morning. They did give me an unofficial copy which is good enough to start the customs process. I catch a taxi to the Aduana office and once I find the right office it’s great; they are actually happy to see me and assign an English speaking assistant to help me complete the form. Once it’s done you usually have to go outside and down the block to make a copy but since it’s pouring sheets of rain they tell me just to fill out a second copy in their office. Wednesday morning Will and I are at the other port when it opens. We are assigned a port consultant who will assist us in the rest of the process which is pretty nice as we were expecting a day of running around from office to office. The first snag of the day is when he asks for our medical insurance. I just have an old Blue Cross card and Will has something similar. It does not work. They want a detailed policy showing coverage for any accidents occurring in Colombia. 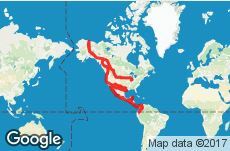 We both buy an internet policy from World Nomads for 1 week coverage ($48 USD ouch) which satisfies them. Lots of form filling and I got designated as the container owner which means I have to sign and print my full legal name and passport number many many times. Every once in awhile we have to go out to the bank counter in the lobby to pay one fee or another. Finally we are ready to go into the port and open the container, except the machine that brings the container to the unloading area is broken. Come back after lunch. And they are serious about their lunch hour and a half here, at 12:00 the office lights go out, curtains down, doors locked. After lunch we return and get ready to enter the port. Safety vests and helmets are mandatory, except they have only one set so Will gets the helmet and I wear the extremely smelly vest. We get there just in time to see our vehicles coming out of the container. A brief check by the customs agent and she hands us our TIPs. We drive off to the other side of the yard then back into the office for more paperwork. We return to the port to claim our vehicles, but still need to have them weighed for some reason then a couple more forms and we are set loose into Colombia.